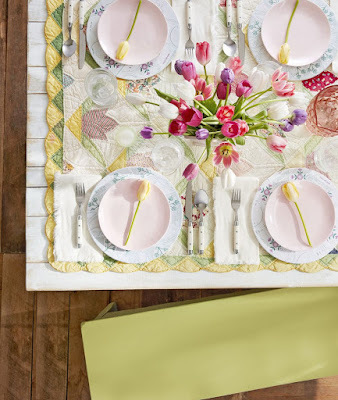 It's easy to customize an ordinary garland for extraordinary impact. 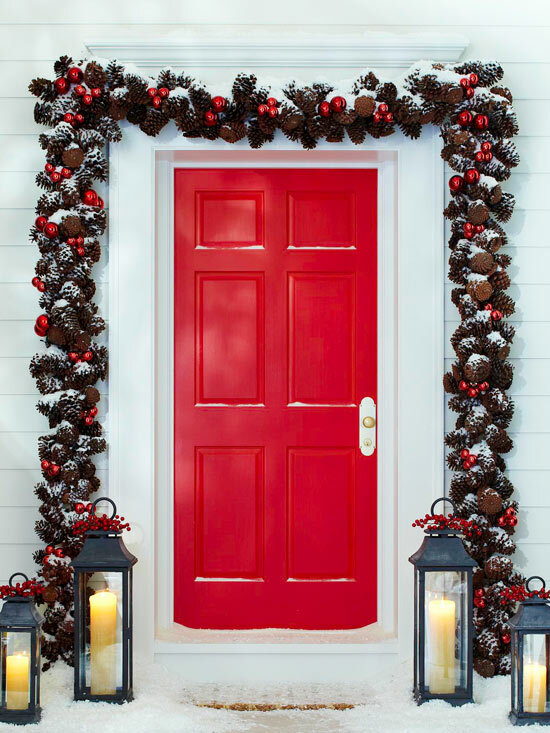 Small holiday ornaments secured with hot glue coordinate with this red front door, adding bright pops of color to a premade pinecone wreath. Tall lanterns, adorned with small sprigs of berries, add to the colorful Christmas door decorations. 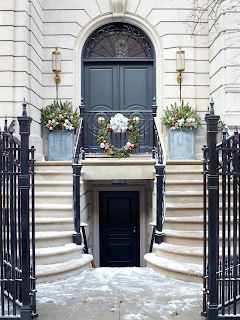 Ornate doors and wide front entryways need little decoration. 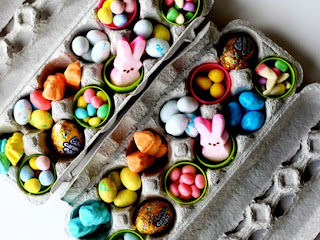 Instead, add accents to the surrounding areas to create the perfect holiday look. 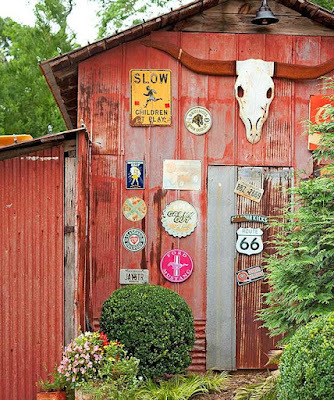 Two containers flank this wide entry; their placement plays off the elegant front porch's symmetry. 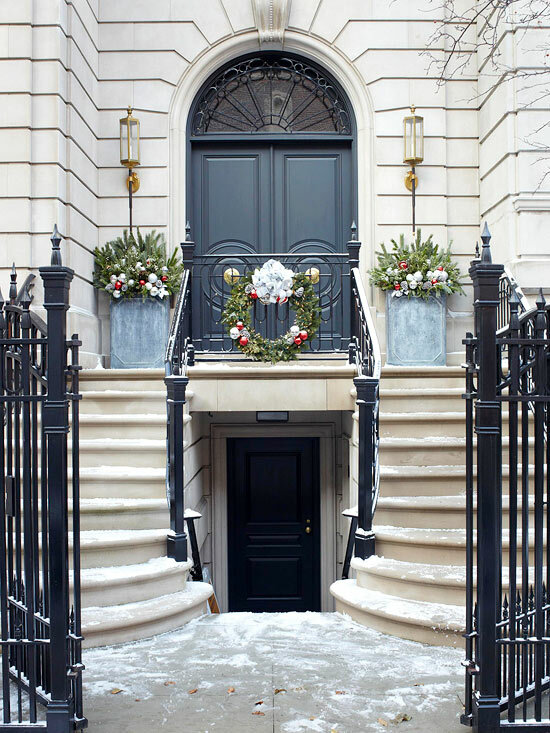 Bright silver and red holiday ornaments accent both the containers and the evergreen wreath. 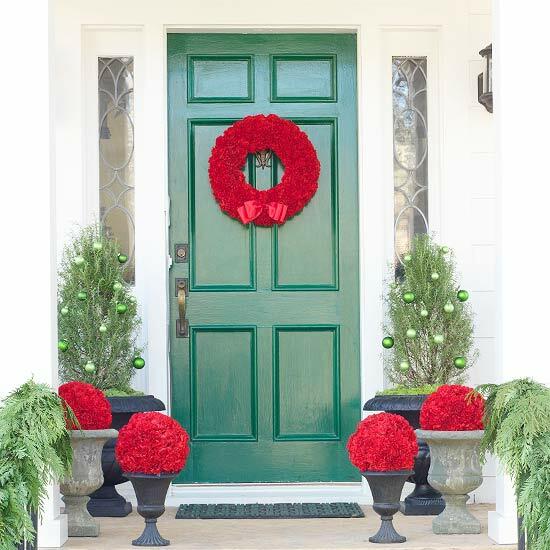 For simple and classic Christmas door decorations, use a traditional evergreen wreath and garland with red accents on your front door and porch. Hang white icicle lights above the entrance to illuminate the festive display. 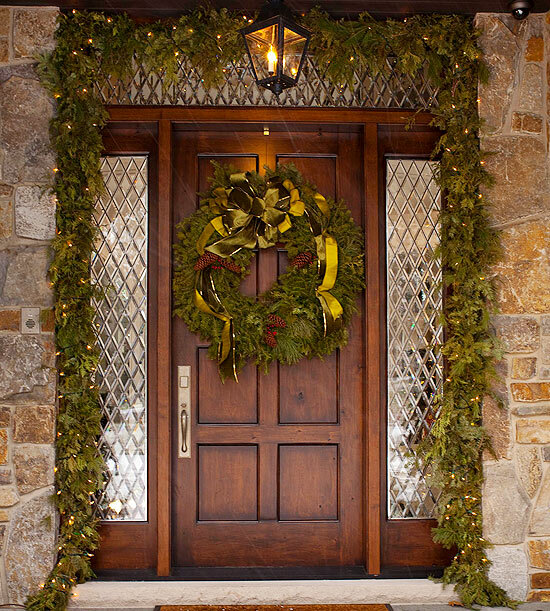 There are several ways to decorate a door for Christmas without using a traditional wreath. 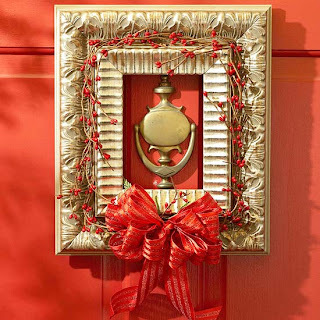 For a festive and creative idea, accent your door knocker with a pretty picture frame. 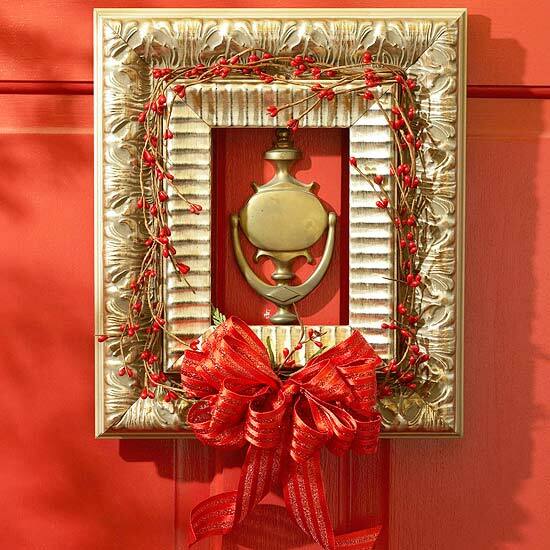 Frame your door knocker with a golden picture frame dressed up with small red berries and holiday ribbon. 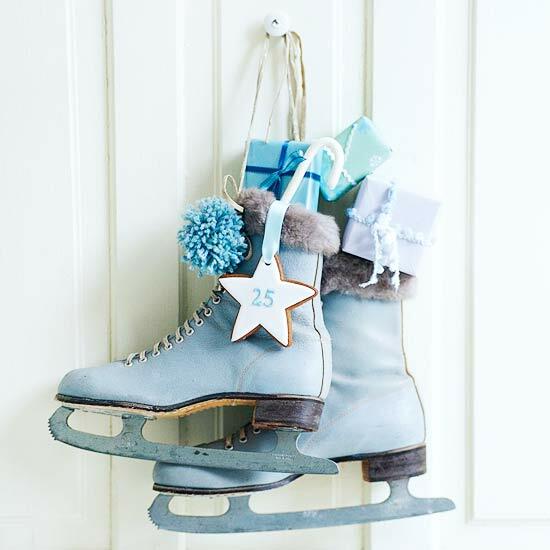 You can decorate a door for Christmas by creatively repurposing items, such as this pair of old ice skates filled with tiny wrapped gift boxes. 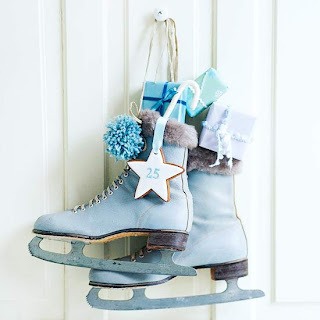 Tie the look together in a wintry blue color scheme complete with small ornaments and pom-poms, or use a traditional red-and-green combination. 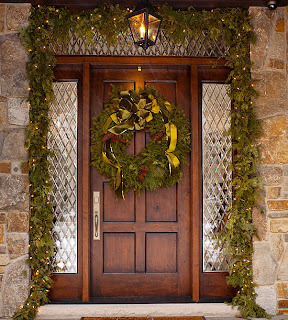 Change a traditional Christmas door display with this easy tip on how to decorate a door for Christmas. 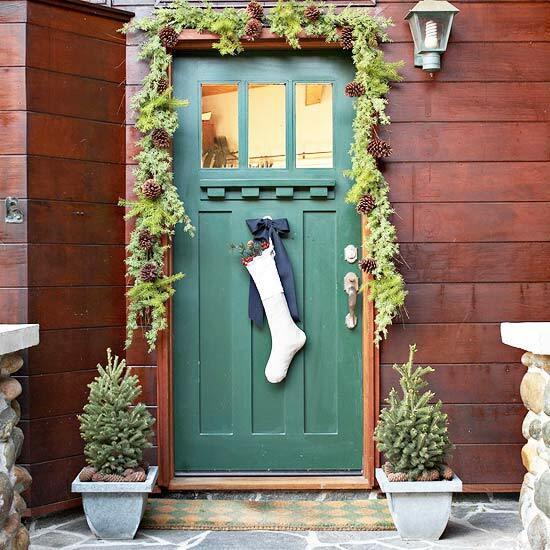 Frame a stuffed stocking with a simple over-the-door garland to add an interesting touch to classic Christmas door decorations. 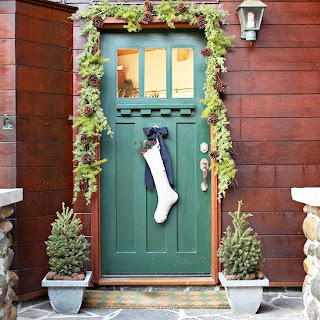 Stuff a plain stocking with berries, evergreen, and small pinecones, then hang it with ribbon from the middle of the front door. 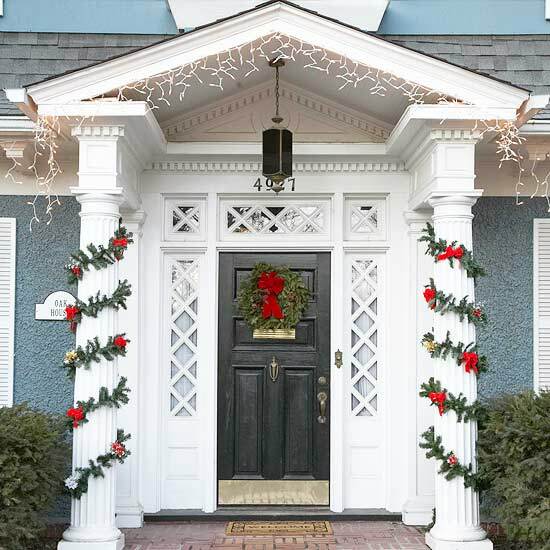 Arrange a simple garland decorated with pinecones around the door frame, and complete the scene with two miniature Christmas trees in matching pots with pinecones at the base. Play up the traditional Christmas red-and-green color scheme with a modern spin. 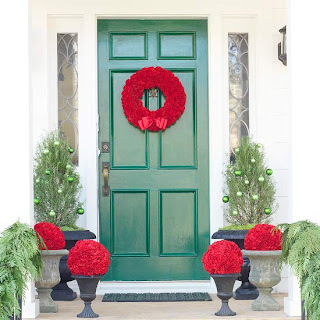 If you have a green door, accent it with an all-red wreath and place your favorite bright red flowers on the front porch (poinsettias would make this scene particularly festive). Don't have a green door? 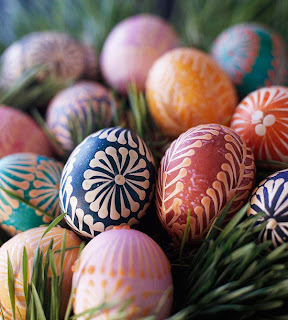 Play around with other color schemes, such as white and blue (good for lighter doors) or silver and gold (good for darker doors). 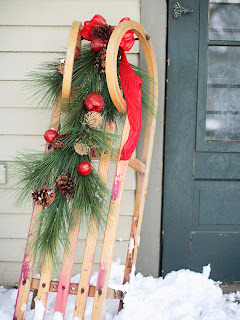 Lean a vintage wooden sled next to the front door and decorate it with a small garland, pinecones, ornaments, and a bright red bow.